The Xerox’s research lab demonstrated reusable paper. No, no, not recyclable which is any paper, but reusable. Information printed on it disappears in 24 hours. The developers claim a sheet of such paper can be use up to 100 times without compromising quality, of print presumably. From the outside, the paper looks like an A4 sheet. From the inside, however, it is made of thousands of UV-sensitive molecules that interact with UV radiation of printer and change their properties. A day later, the molecules exposed to the radiation change back to initial properties. So, no toner is needed. Currently, this technology only works for black-and-white printing. The very printers are so compact that they can be mobile. 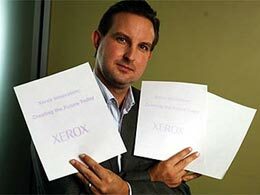 Xerox first announced the reusable papers late in 2006. At that time, the paper was said to keep printed info 16 to 24 hours and be reused up to 50 times. A question remains whether the new paper would be durable enough, since I can’t think of how gentle one should handle a printed sheet so that it lasts 100 reuses. This entry was posted on Sunday, May 4th, 2008 at 3:06 am	and is filed under technology, Xerox. "12 Facts About Solid Inks"
"Samsung Creates The Smallest Color Laser Printer Again"